The SuperFlo™ Pump is specifically designed to be the best available product for a variety of inground pool applications. SuperFlo features thick walled body parts, a heavy-duty 56 square flange motor along with highly engineered hydraulics. This pump also comes equipped with a silent running capability and small footprint allowing it to easily drop into a compact equipment pad. The SuperFlo pump is the result of more than 40 years of innovative hydraulic engineering. All in all, it will provide your pool system the ability to move more water more efficiently for lower operating cost and quieter operation. Plus, by performing with less effort, there is simply less wear and tear which, means longer life for a higher return on your pump investment. Unionized fittings (1.5" internal slip and 2" external slip). Cam and Ram lid locks in place with a quarter-turn. Just had pool opened for season. After being open for about 24hrs noticed pump making loud whining noise. When I checked it out the diverter valve was closed. Could this have affected the pump? I currently have a Pentair Model SF-N1-1A/340038. I have noticed on your website you recommend a different replacement. Is this a better pump,quieter? Does this pipe up and wire up the same as Pentair 340038? Hi, Dan. The pump operating with restricted water flow can damage the pump. The Pureline PureFlow pump is a less costly option. It's about the same sound level depending on how the pump is plumbed. It can be wired for 115/230 volts and the inlet plumbing port of the Pure Flow is slightly higher than this SuperFlo pump. I have an A.O. Smith B2841 1 HP that I need to replace. Is the Pentair 340038 SuperFlo 1 hp a compatible replacement? Thanks. Technically, if you would like to replace the entire pump with matching motor specs as far as the strength then the model Superflo would be the 340039. I have a Super Flow from around 2004. What is the replacement pump for 1 HP Super flow ? Hi, Matt. If you have the Pentair SuperFlo Pump, this is the correct replacement. This pump has 1.5-inch ports internal thread and also comes with unions that can be used for 1.5 or 2-inch plumbing. does this pump have a mfg warranty ???? I was told that on the box is says no warranty. A Answered on 12/22/2017 by InyoPools Product Specialist Kevin G.
This has a 1-year manufacturer warranty. i have a Pentair 342854 pump, which seems to be sucking air in the housing somewhere. what is the best replacement- where major plumbing change will not be required? A Answered on 7/20/2017 by InyoPools Product Specialist Hector F.
There are a number of causes for a pool pump to pull in air. Please view our article and guide on "How to Identify and Correct Air Leaks" for some guidance. 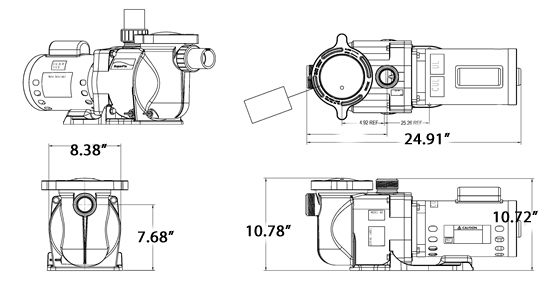 Also if you click here you can see the parts diagram for your pump. There is the GOKIT24 which replaces all seals and gaskets for the Pinnacle. Yes, that motor part number is the B853 on this parts diagram. Please keep in mind that if the motor hs been changed since the original then you want to cross reference that motor based off of its specific model, part or catalog number that should be on its label. A Answered on 2/13/2017 by InyoPools Product Specialist Alan M.
Here is a link to the Pentair Superflo high performance pump brochure. It includes a chart for the performance curve indicating the GMP information you requested. Hi, This pump uses 1,633 kW. Yes these pumps for sure use A.O. Smith motors. What is the Superflo suction and discharge height differences with the Intelliflo VF and it there an adapter or way to replumb this accordingly? Hi Pete, Here are the Superflo Suction & Discharge Dimensions Vs. the Intelliflo VF Suction & Discharge Dimensions. There is not an adapter kit specifically for going from the Superflo to the Intelliflo you would just need to re-plumb using standard plumbing supplies. If you want to got to variable speed and not re-plumb then you might consider the Superflo Variable Speed Pump. Hi Natalie, I would suggest a Super Flo Shaft Seal, Super Flo Body O-Ring and a Super Flo Diffuser Seal. The changing of these 3 items should stop your leak. I have a Pentair 340038. Motor sounds bad. What would you recommend to replace motor and other seals needed? 110v. 2 speed with timer would be great. Hello Fred - The correct 2-speed replacement is model B2981T. This is a 3/4HP full rated motor but the total HP is the same as your current motor (1.25). The shaft seal, housing o-ring, and diffuser o-ring should be replaced as well. I have a Pentair pump part # 340038 with a date of 2008, should a new Pentair hook up to existing plumbing? My existing pump just last night got really noisy, almost a whining sound. Is this an indication pump is going out? A Answered on 4/25/2015 by InyoPools Product Specialist Alex V.
Dan, The pump should line up the same way as your existing Pentair SuperFlo. It sounds like the motor is failing/has failed. You can also consider replacing the motor and seals. Hi I am looking to replace my inground pool pump with a Pentair Superflow Single Spd Motor - Pretty Sure i need a 1 Hp Model (vs. 3/4 hp) but wanted to get your thoughts - 24000 Gal Pool; 1.5" PVC Piping; Need about 51 GPM to tunrover in 8 hrs From what I read maximum from 1.5" pvc is about 53 GPM Estimated Total Dynamic Head - 50 Feet I want to make sure I have enough hp but not too much to risk cavitation etc...so can you let me know your thoughts? Hello Ron - Based on all of your variables, we would recommend the 1HP Pentair SuperFlo. What kind of a warranty comes with this pump? Is it parts and labor? I replaced a 1 hp pump that was at least 15 years old. This new pump is much quieter, and moves more water. Easy to install and the plumbing matched that of the old pump. InyoPools shipped the item incredibly fast. I'm impressed with their prices and fast shipment. Thank you. Easy to order on line. Standard shipping, received fast. Pump was easy to hook up and is very quite. (5 out of 5 stars) Love this pump - love this website! We just moved into a house with a pool and had no prior knowledge of pool care. We did know that the pump sitting there should not make that much noise! My husband searched the internet and found the inyopools website - what a blessing! The website is great for any information you need and they offer a very easy to use chat option where you can chat with a real person. We've learned so much just from inyopools.com. What a valuable resource! The pump is wonderful! It's quiet (we almost weren't sure it was running when we first hooked it up! ), has great pressure and looks sleek and well built. The low price was just a bonus! My husband found wiring diagrams and everything he needed to make the transition smooth and seamless. Thanks for all your help and a great product! Pros: Includes everything needed for install. Cons: Could still be quieter. Excellent pump, much quieter and more efficient than the WhisperFlo 2HP that it replaced. Had the pool builder utilized the union fittings on my original pump, this would have been the easiest thing to install in a long time. I had to simply add 2 couplings into my installation and elevate this pump with a couple of bricks, powered it up and was surprised by how quiet and quickly it primed.